A stout defensive effort by the UNBC Timberwolves on Saturday evening in Prince George sent the University of the Fraser Valley men’s basketball team to just its second loss of the season. The Cascades, 77-71 winners over UNBC on Friday, came into the rematch with the second-most prolific offence in Canada West (83.4 points per game) at their disposal. But the T-Wolves managed to limit them to 26 points less than their average – they held UFV off the scoreboard for the last six and a half minutes of the fourth quarter, thus parlaying a slender 60-57 lead into a 69-57 triumph. It was an uncharacteristic offensive performance for the Cascades, who shot 33.8 per cent from the field and generated just eight free throw attempts (hitting five of them) while turning the ball over 20 times. UFV, which leads the Explorer Division and holds the No. 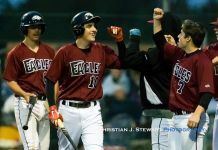 9 ranking in the CIS national poll, saw its record dip to 16-2. The T-Wolves improved to 10-8, which leaves them tied for second with the Thompson Rivers WolfPack. Power forward Kadeem Willis was a bright light for the Cascades, counting a trio of three-pointers among his game-high 19 points. Fellow reserve Vijay Dhillon (10 points) was the only other UFV player to score in double figures. UNBC had plenty of motivational fuel – it was the last home game for fifth-year seniors Franco Kouagnia, Devin McMurtry and Jeff Chu, and they were closing in on the program’s first-ever Canada West playoff berth. The T-Wolves’ win, combined with TRU’s 66-62 victory over the Mount Royal Cougars, locked up that historic post-season trip. Kouagnia (17 points, 12 rebounds) and McMurtry (12 points, 13 boards) both had double-doubles for the hosts, while Rhys Elliott scored 14 points and Chu chipped in with nine. 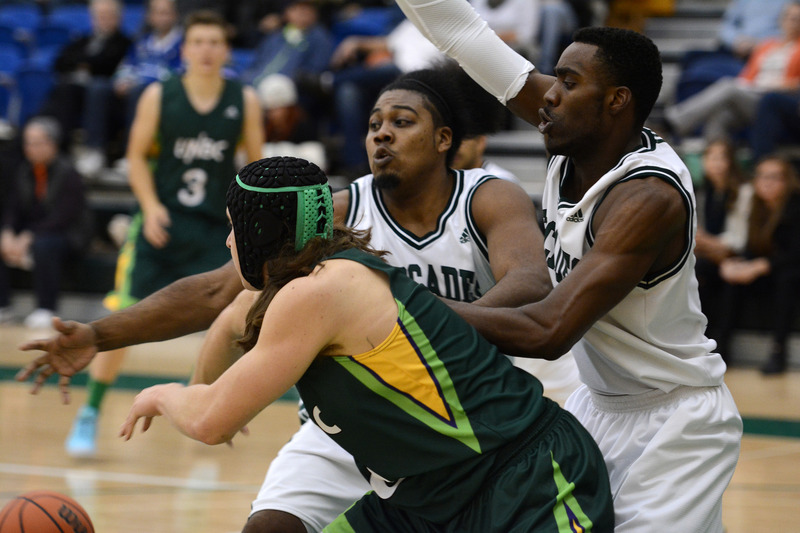 The Cascades basketball teams wrap up the regular season at home next weekend vs. the Thompson Rivers WolfPack. Games run Friday (women 6 p.m., men 8 p.m.) and Saturday (women 5 p.m., men 7 p.m.) at the Envision Athletic Centre. Saturday will be Senior Night – the UFV men’s hoops program will be celebrating graduating fifth-year players Willis and Jasper Moedt, while the women’s squad will be honouring fellow fifth-years Sarah Wierks and Celeste Dyck.